There is a contest in there for you (scroll down) and you can win one of our petite dainty lampshades. 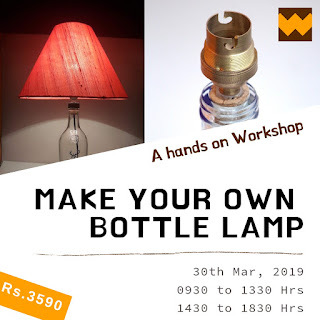 Loads of exploration has been going in the Woodooz studio and we have been working on getting newer versions of our table lamp into the market. After having worked with metal shades, and shades with a combination of wood and stainless steel, we have been wanting to do something traditional with wood and thus came about the idea for this version of table top lamps. Nothing new. Yet, a completely original Woodooz masterpiece that we are launching on the 14th of Feb, 2017. We have been seeing lot of bases with MDF and artificial wood and other materials with faux wood finish. We wanted something authentic. Something that is made of first quality wood. Something that is durable and adorable at the same time. 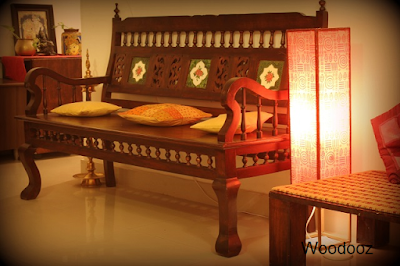 And so for our new table lamps, we use best quality pine and teak wood. The wood we use comes directly from the timber store which allows us to pick only the finest degree pieces. The finish is pristine with walnut, rosewood, teakwood and natural colors. The grains on the wood surface combined with our workmanship gives a spectacular look to the finished product. It is indeed a statement piece that you would love to own and be proud to show off. We are keeping in mind your sensibilities and tastes and are one hundred percent sure that this would be a show stopper and a conversation starter in your living room. You most certainly will have a wide range of shades to choose from. 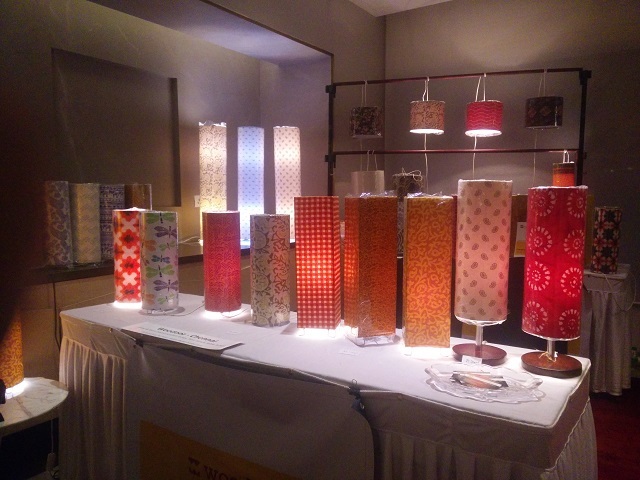 Know what we are calling this range of lampshades ? This is where we need your help. Read on. 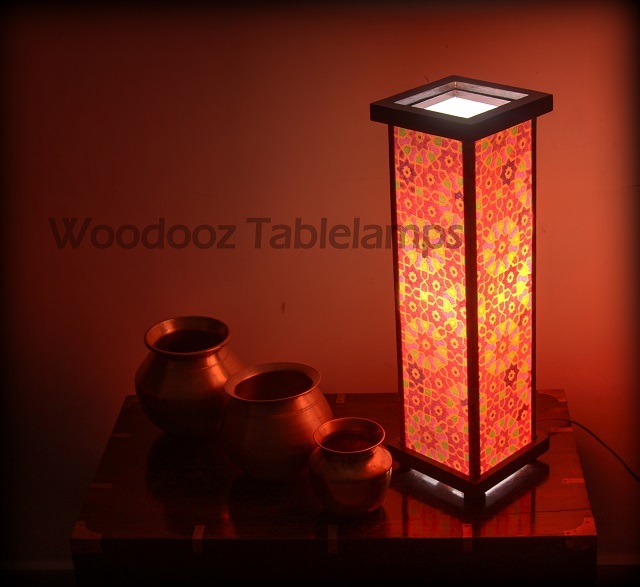 we are looking to YOU to come out with a nice name for this range of tablelamps. Something unique, original and uber cool. The winning entry would win a brand new petite table lamp. Game ? Here are the rules and eligibility criteria (You can directly jump to the embeded post on FB). All the above three criteria needs to be fulfilled for eligibility. The winning entry (To be decided by a neutral judge would win this lovely dainty lampshade. You can leave as many name suggestions as you want. If two of you have commented the same name, the one who had commented first would be considered. The contest is open for anyone around the world. 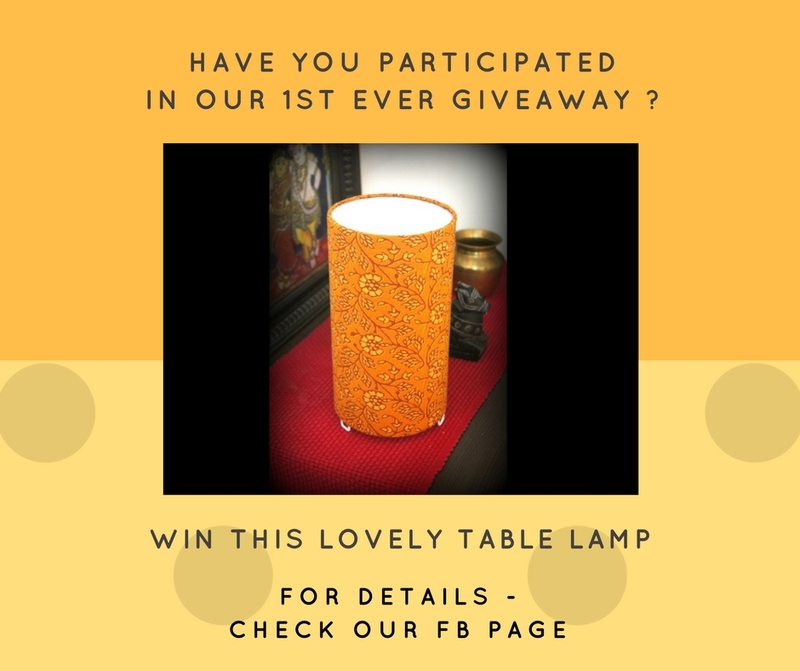 However, the winning lampshade will only be shipped to an Indian address (We havent started shipping internationally yet). GAME ? Help us will ya in giving us a really cool name for this range. Looking forward. Wear your thinking hats and let the creativity out. The contest closes on the 13th of Feb, midnight.. In our home we often find things that do not belong in a space- either because it belongs elsewhere in our home or it doesn’t belong in our home any longer. Old newspapers, clothes, wire, toys and so on. We have the tendency to hold on to things either because we think we may need them in the future or if we hold an emotional attachment to it. If you find stuff lying around idle for over 6 months, you probably won’t find a use for it ever. Dispose them, donate them, swap them with friends. Things that are close to your heart could be neatly organized and packed in cartons to be put in the attic or loft. Either ways, clutter is the culprit. 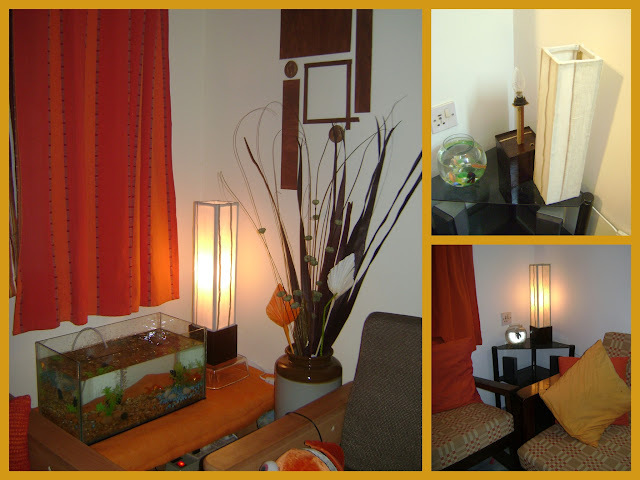 According to Feng Shui, clutter disrupts a smooth flow of energy in your space. So clear them, organize them, find a space for everything in the house. Be bold and mix and match bedding and curtain- colors, prints, style. Whatever style your room may be- be it contemporary, eclectic or ethnic, be open to putting different pieces together to get that desired look. Especially in India, we have such beautiful collection of handloom material- each with its own unique style and finesse. 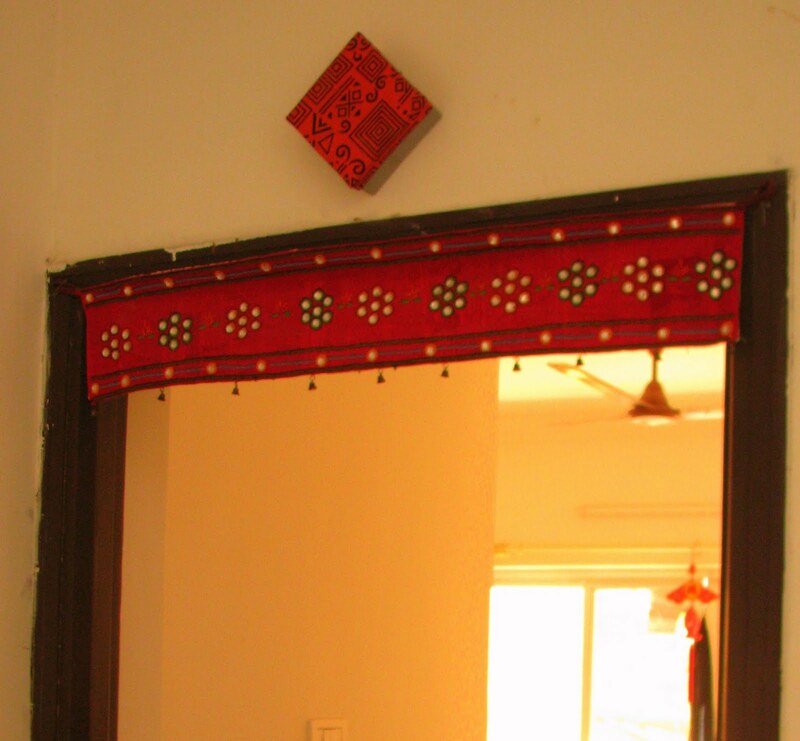 While floral prints go very well in a contemporary space, shiboris, ikats, kanchis and kalamkaris work beautifully well in a typical Indian ethnic home. Watch them transform your home into a dreamy one. Add wall hangings, antiques and other shoe pieces that add further life to the space and bind everything together. Make sure they are matched with the theme and style of your space. You could also choose them depending on the room. 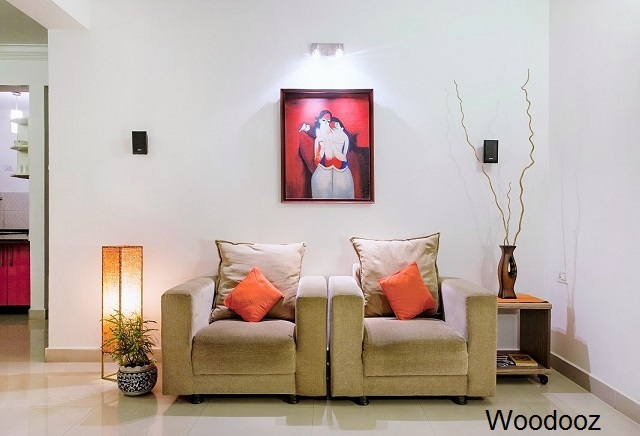 You could hang a piece of art in foyers or focus wall. Bring in some indoor plants to add life to your interiors. It was only 3 weeks before that I received a call asking me if I would be interested in doing a stall in the 19th Edition of the “By Hand, from the Heart” event. Without much thought and despite not having an inventory, I gave a positive response. And thus, started the roller coaster ride. Diwali is only round the corner and it was a perfect opportunity for us to showcase our gifting solution for the festive season. We decided to not use the existing inventory that we had put up online and started work on a completely new set of lampshades for the season. From block printed fabrics, to hand woven to IKAT and Kalamkari to handmade papers we carefully handpicked the fabrics to reflect the Indianess to go well with the festival. Burning the midnight oil, we thought, was a thing of the past when we used to prepare, on the previous night, for the final exams. 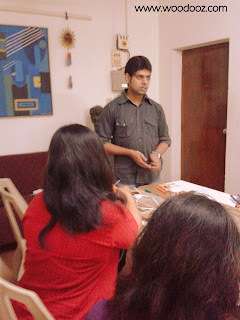 But then, it turned out that we had to forego a lot of sleep in preparing for the event. 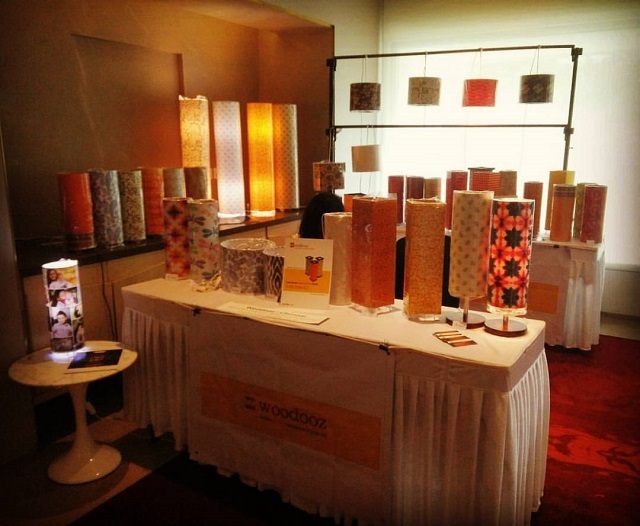 60 Lampshades is what we had in mind to showcase and we started working towards that. 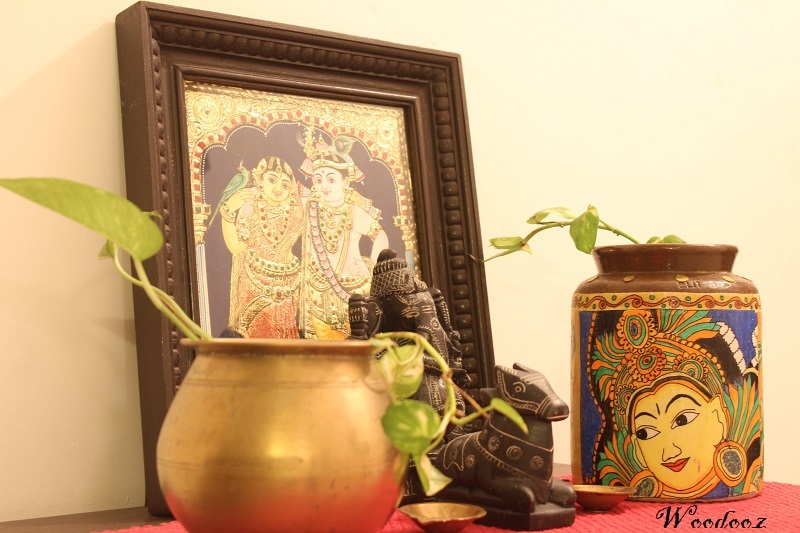 With a toddler to manage at home, and Navratri parallely going on, it was a challenge to find time during the day for the work we needed to do. And so, the after dark because our companion. Though we did have a checklist (That requires a separate post by itself) , like always, it boiled down to getting things done in the last minute and in the process, had to suffer 11th hour nervous breakdown (:P). Everyone pitched in and we managed to do 40 shades, a good 20 short of our original target. We had as awesome experience exhibiting our work to the general public for the first time. And it was such a pleasure to meet so many people and strike interesting conversations with them. It was two days of sheer fun for us and is something we would certainly love to go through another time. Only, this time we would be better prepared. Here’s a snapshot of the stall. The Diwali collection is getting uploaded on our shop site and will be up in a day or two’s time. Do subscribe to our Facebook Page to stay updated of all that is going to be happening with Woodooz. 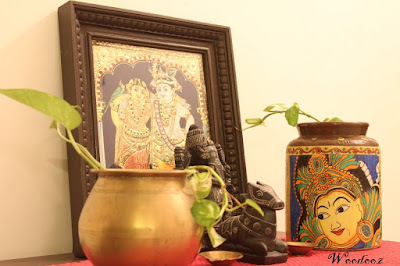 Do you keep Golu at your home ? We do. It was a tradition that was once (I don’t even know when) started by my mother and for the last few years Preethi has been ardently keeping up with the tradition. In fact, I got to participate too last time when she wanted a 5 step Golu padi to be DIYed to be used every year. It was a fun project and I had fun making the flat pack Navratri steps. If you have not read the post or seen the video, you should do it now. For this year, given that I was already making loads of lampshades, I wanted to do something unique for display. And that is how the Dasavataram Lampshade idea came about. Knowing that lifting off a design from Google is criminal, I approached Raji Madhu to help me with a design. After dabbling between Durga and Dasavatharam, she finally decided to do one on Dasavataram. While Raji Madhu warrants a full post, I want to just mention that she is a very talented fabric designer who is passionate about art. And it reflects in the interest she shows in imparting that talent to kids and youngsters through her art class. Less than a week is all that it took and the design was ready on paper. She was so pepped up and the excitement rubbed off on me too. And so, here’s the final outcome. She loved it. I loved it. And guess what ? 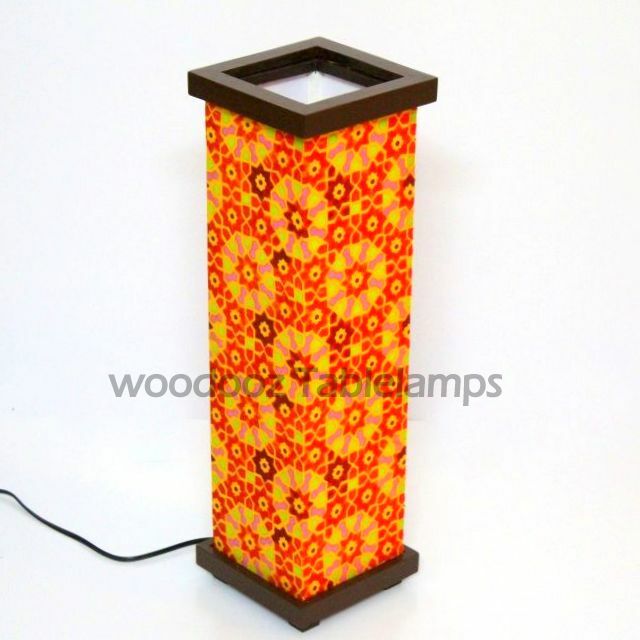 The lampshade has garnered amazing response and we have been shipping it to all parts of the country. 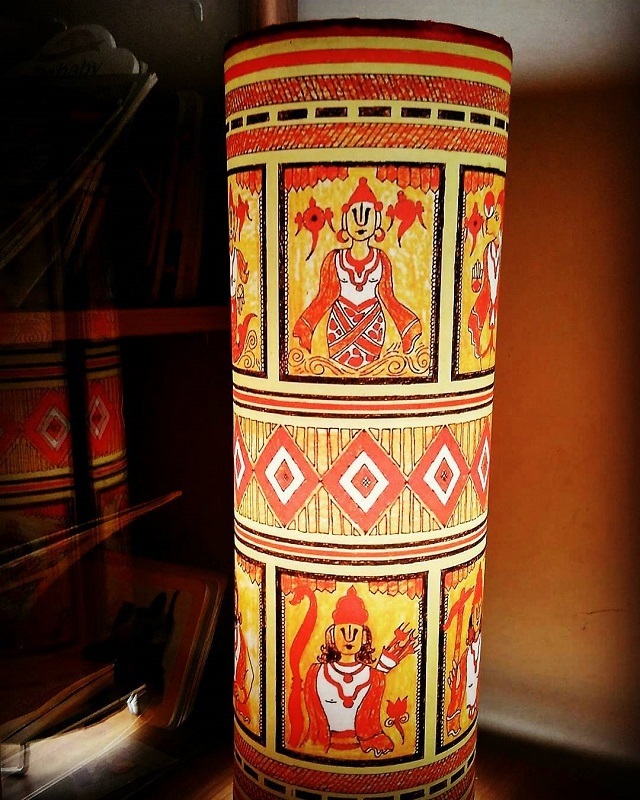 Want to buy this interesting and unique lampshade ? Click here and make your booking NOW. P.S. 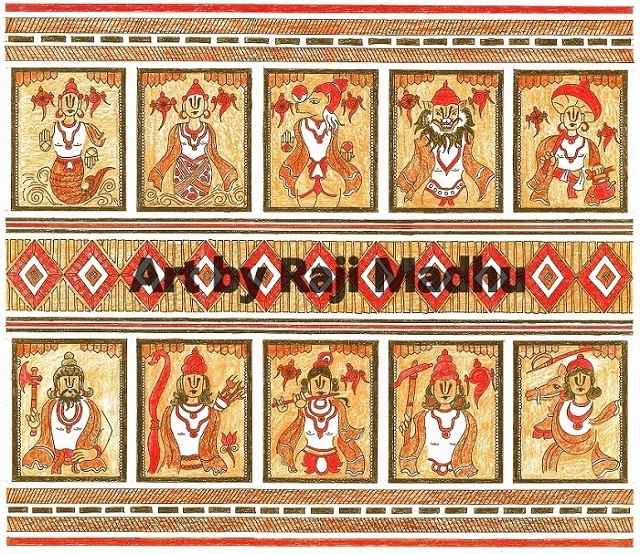 This painting is original work of art by Raji Madhu. Use of this image on your website / blog whether for commercial / non-commercial purposes is strictly prohibited. We are always looking to personalize our ambiance so much so that we want it to reflect our tastes. This is the reason why some of us take our own time browsing though aisles in a mall or a shop on the internet. You always have an individuality that you want reverberating through the choice of items that you pick for your home. 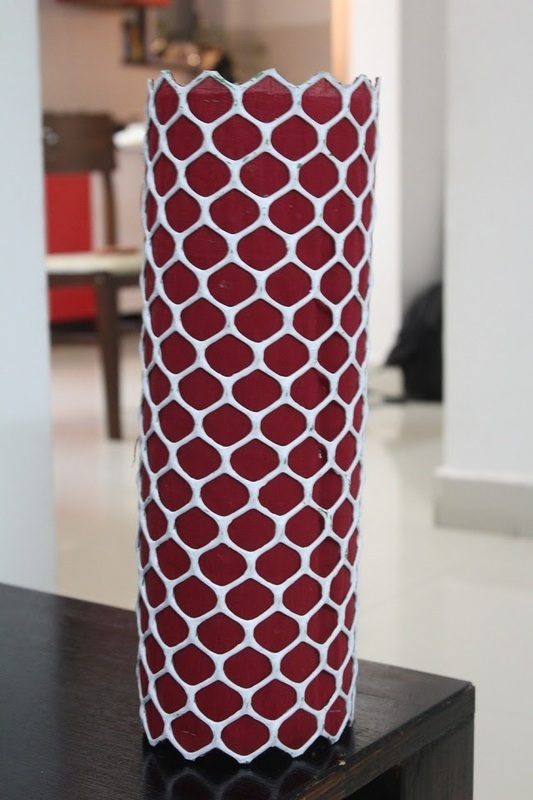 And if you are that type of person who adds value to his / her space by carefully handpicking everything to give a custom feel to your room, you would love this - A Photo Lampshade. There is no better way to personalize anything than by using one's own photos. Lampshades are no exceptions. You create memories of the times gone by and use this simple, yet beautiful statement piece to relive your most precious moments. You can dwell upon your treasured occasions by placing this by the corner of your bedroom or in the middle of your living room for that much needed accent. Imagine how much this would excite the kids. Any which way you look at it, the lampshade will have every bit of your signature and will be a sure shot conversation starter. In a world where we are mostly storing photos digitally, this is a great way to get those memories out of your pen drives and clouds and DVDs. All you would need to get this going is a lovely collection of your most cherished photos. Ideal for photographers who want to highlight their best work like the pendant lamp you see below. 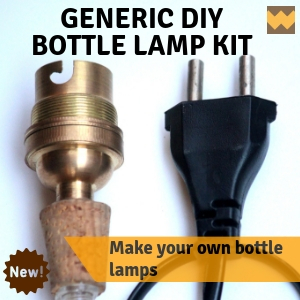 If you are a DIY person you can make your own lampshade. There are loads of software like Picasa to help you with getting the images together. Am sure you can find inspiration on the internet for this. 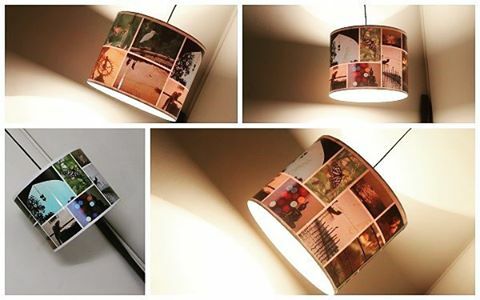 Or better, you can be done with choosing the photos and have someone worry about making you a wonderful lampshade. 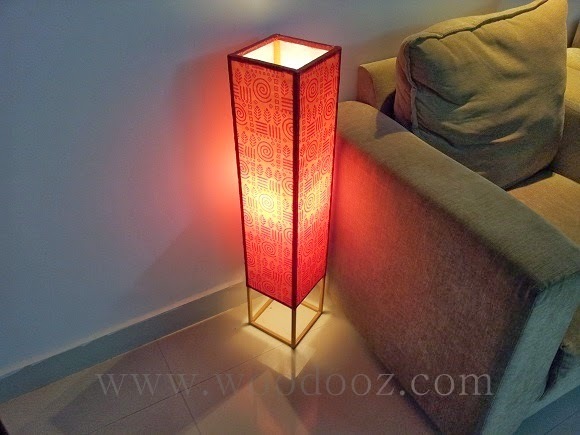 There are online shops from where you can buy photo lampshades. Either way, you will end up with something gorgeous, one of a kind and completely personalized. Am working on making one for my family with pictures of my wife and I with the little toddler. And am excited. Will certainly share it here once am done with it. In the meantime, do let me know what you think of this. Your comment will certainly mean a lot. 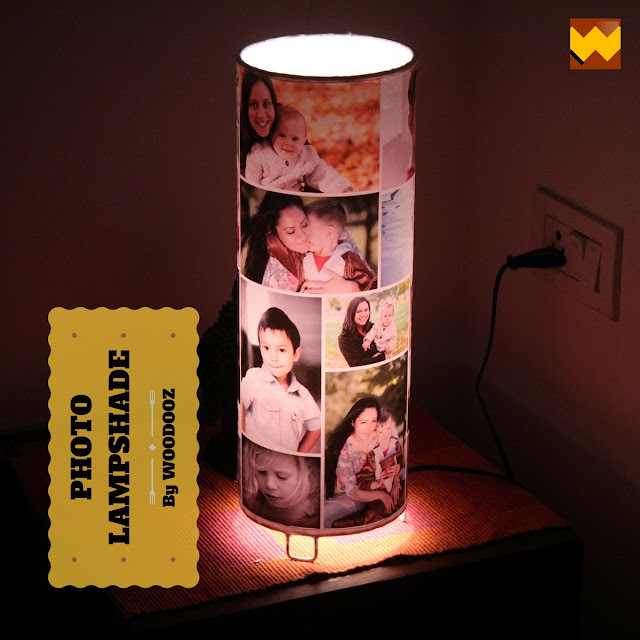 You can order for your personalized photo lampshade at Shop Woodooz. CLICK HERE for the details. The images used in the first two photos above are free stock images that require no attribution. Meet Kuril (குறில்), an exquisite creation, from the soon to be launched Woodooz Store. KURIL in the Tamil language refers to the short vowels. The short duration of the utterance of these vowels give them this name. 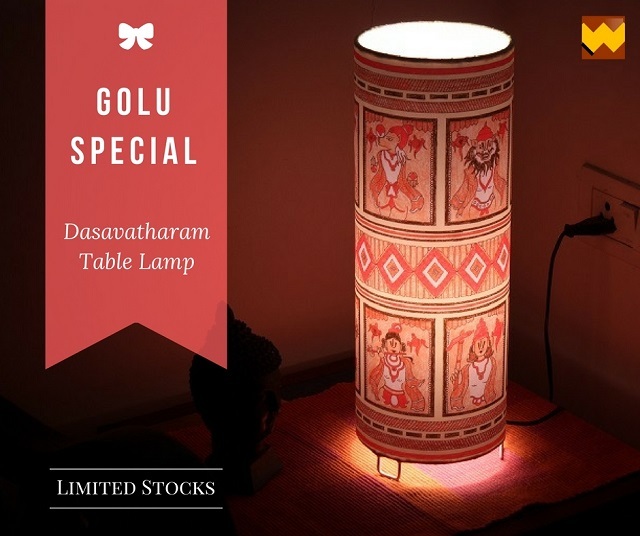 Given that we were particularly looking to name our current and all future line of products in Tamil, this one seemed an apt name for our dainty looking Table Lamps. We wanted to stay away from any design complications, at least to start with, and stick to what our strengths are. And so, the KURIL lampshades, are straight shaped, with clean edges. 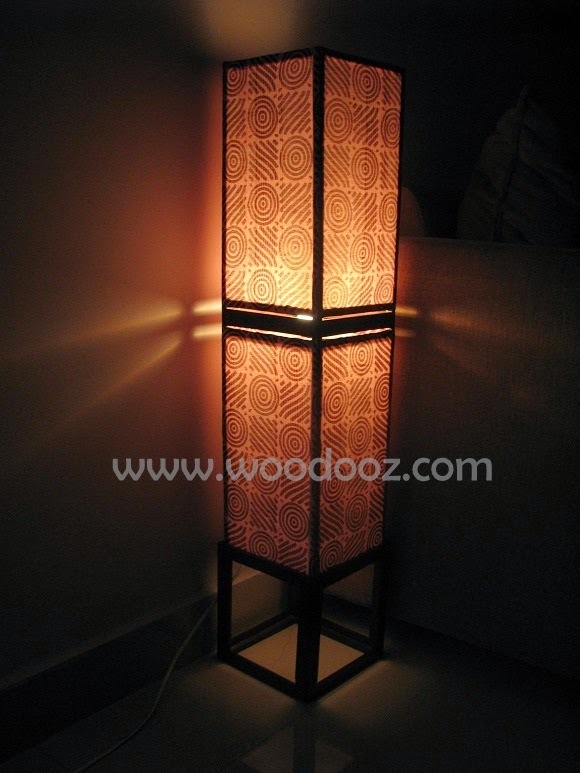 The main frame is made of 12mm sticks that add an elegant border to the shade when lit. The base and the crown of the lampshade are made of an 18mm wooden beading that has been enamel coated with a matte finish that is smooth to the touch. The entire product is handmade and homespun. The frame of the shade is also made from strips of the same wood material. So here you go - One of the KURILs - A simple, chic and petite concoction from our Studio. 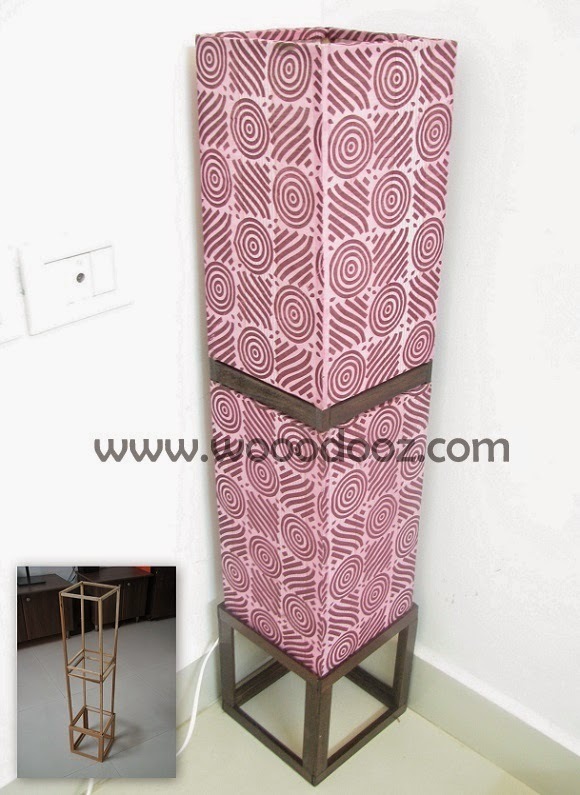 The base and crown are available in either walnut or brown color. The frames, of course, come in varied colors and designs depending on the shade you choose. 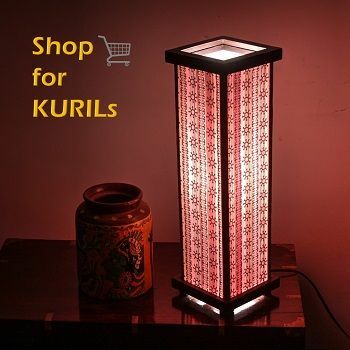 KURIL works well with regular halogen lamps (40/60 Watts) or CFL. The latter is our personal recommendation (40/60 watts equivalent) because of the warmth in the light radiance. Use of warm white or cool white lights is normally a personal choice. 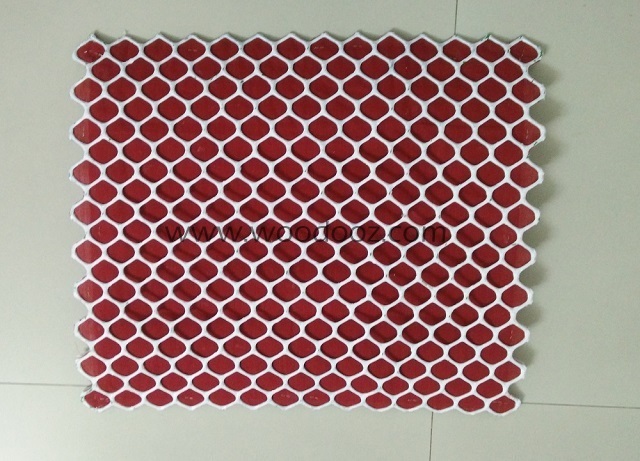 It is perfect for bedrooms, living rooms and dining rooms.You can use it to add a wonderful visual appeal to your already enticing interiors. The shade, we can assure you will not disappoint you both when lit or otherwise. Exudes enough light to provide you a good reading corner, and at the same time remains delicately lit to not disturb the spirit of the exquisite ambiance you desire. Admire it from close proximity and it would still be easy on your eyes - No glares or flares. Be there to meet the KURILs at our E-store on the 25th of July. This was an article that was published in Hindu Metroplus Melange on the 28th of November 2015. Somehow, never found the time to post it here because of the floods that subsequently took up about a fortnight before we could start settling back into our normal lives. So, here's the post that I am reproducing from the article without modification. Hope you like it. Indulging in DIY gives you the freedom to think out of the box, plan and execute an outcome out of run of the mill materials that are meant to have completely different purposes. 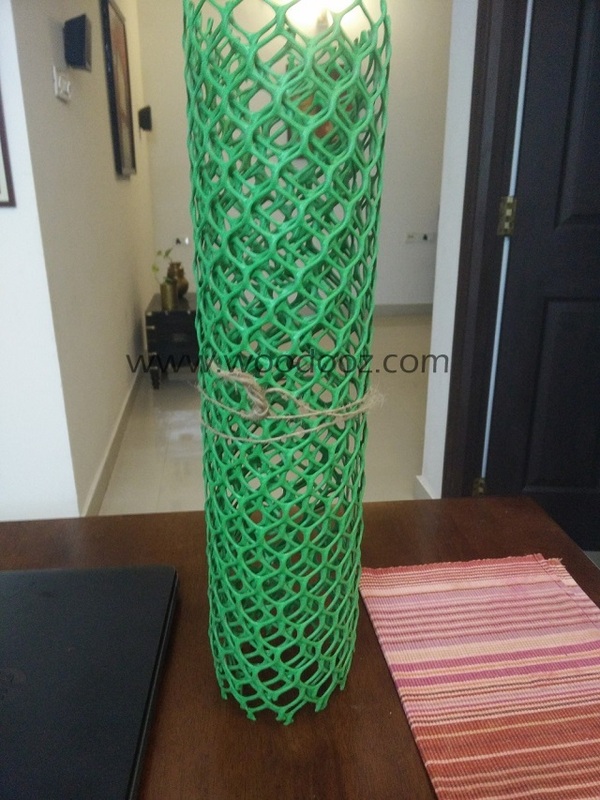 This lampshade is one such item that is built using garden meshes that are quite the common sight along the sides of roads. Not only is the cost of materials required inexpensive, but the end result is something that will give a refreshing look to the otherwise drab mesh. 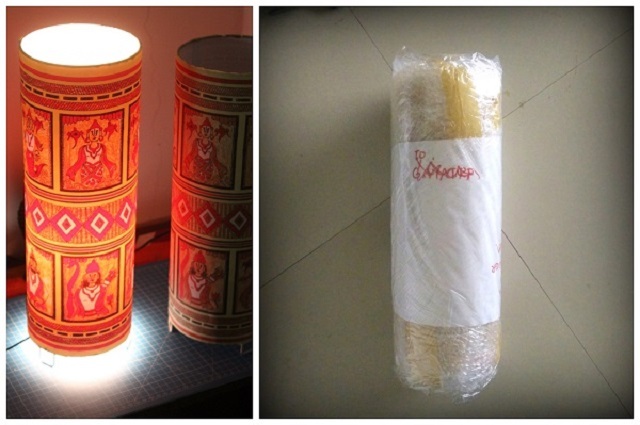 Here's how you too can make this lampshade. Cut the garden mesh to your required size (I used 18 x 15 inches) using a pair of scissors or pliers. 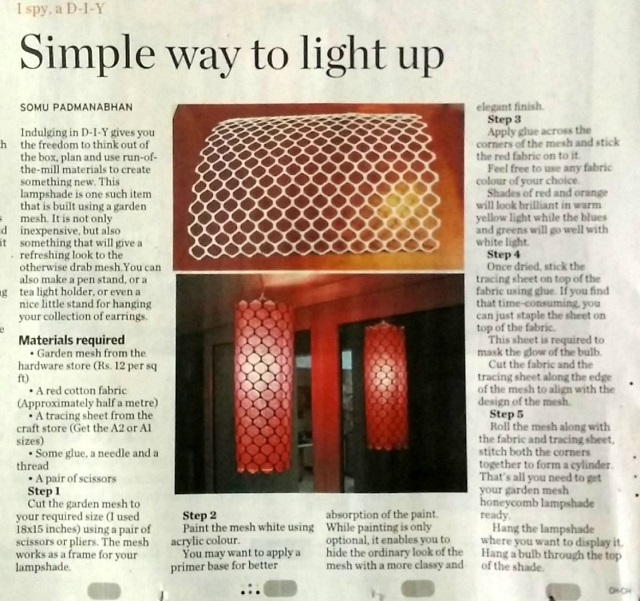 The mesh would be used as the frame for your lampshade. 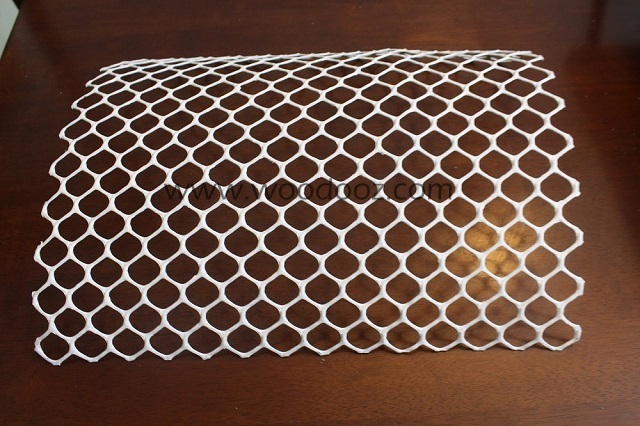 Paint the mesh white using acrylic color. You may want to apply a primer base for better absorption of the paint. While painting is only optional, it enables you to hide the ordinary green look of the mesh with a more classy and elegant finish. 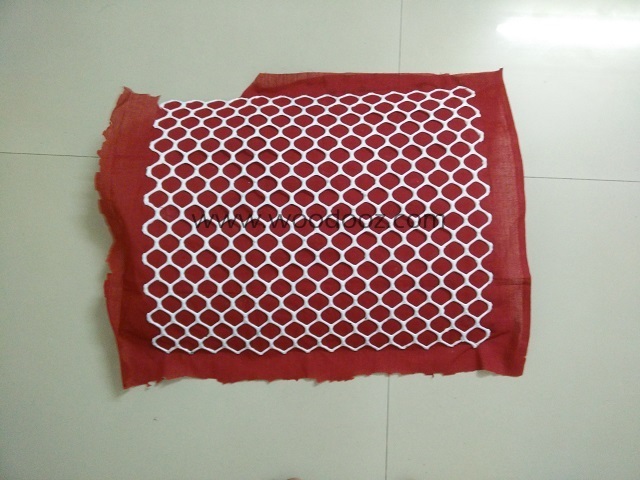 Apply glue across the corners of the mesh and stick the red fabric on to it. 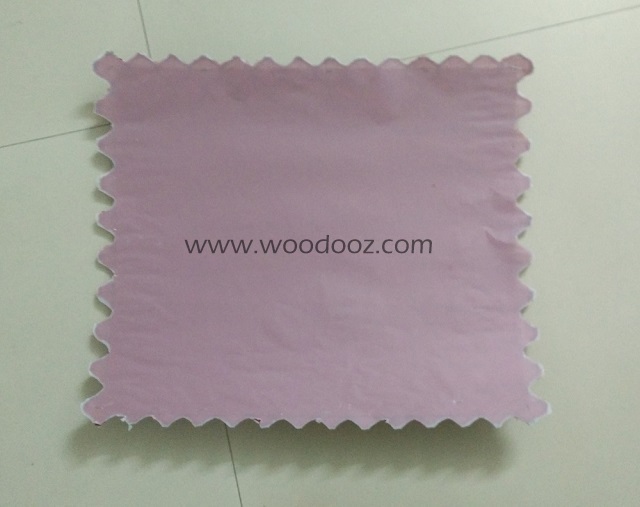 Feel free to use any fabric color of your choice. Shades of red and orange will look brilliant in warm yellow light while the blues and greens will go well with white light. Once dried, stick the tracing sheet on top of the fabric using glue. If you find that time consuming, you can just staple the sheet on top of the fabric. 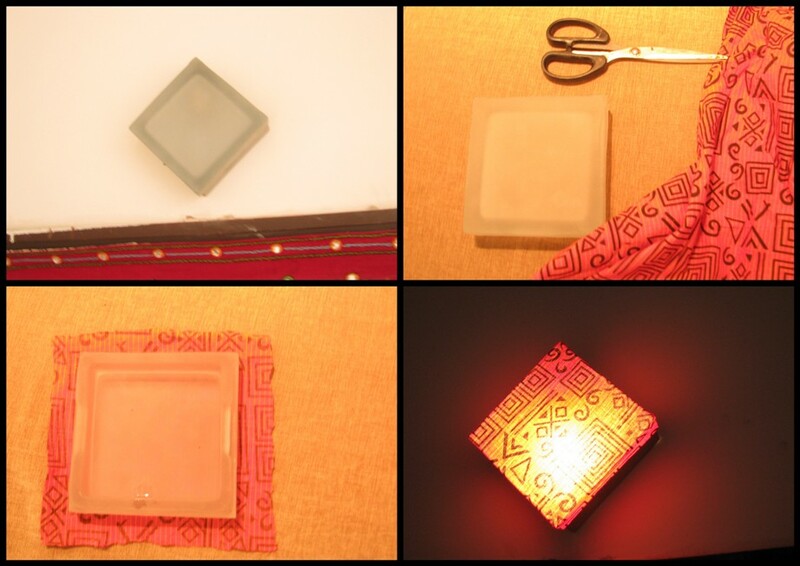 This sheet is required to mask the glow of the bulb. Cut the fabric and the tracing sheet along the edge of the mesh to align with the design of the mesh. Roll the mesh along with the fabric and tracing sheet, stitch both the corner sides together to form a cylinder. That’s about it. 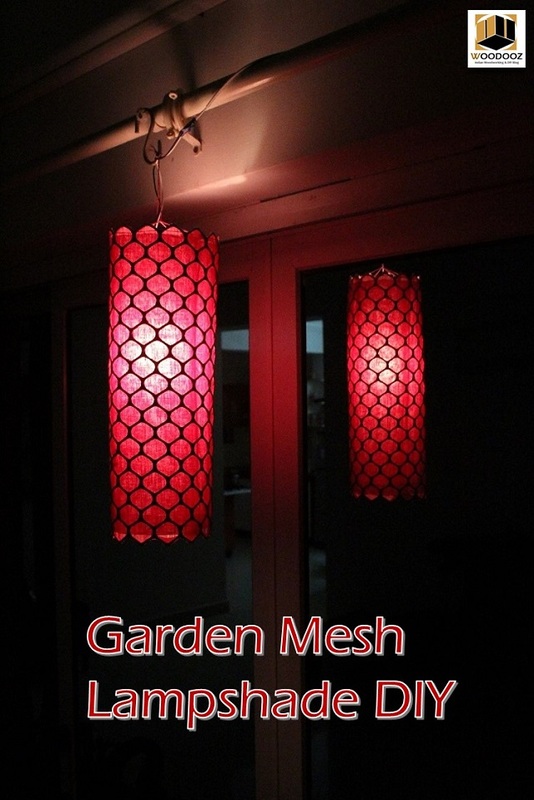 Your own DIY garden mesh honey comb lampshade is ready. The rest of it is just cake walk. Hang the lampshade where you want to display it. Hang a bulb through the top of the shade and let it do the magic. I have this bad practice of deferring things. If something can be done tomorrow, I would rather not put that effort today. So bad this habit of mine is, that it took me 7 months to complete a project that would have otherwise taken 2 days of dedicated work. Don’t know if it was lack of motivation, but I certainly found every bit reason to tell myself, “Hey, enough for today. Let me do this tomorrow”. And that tomorrow eventually arrived yesterday. I had to commission a floor lamp for my aunt and the only specification was the feature wall backdrop. 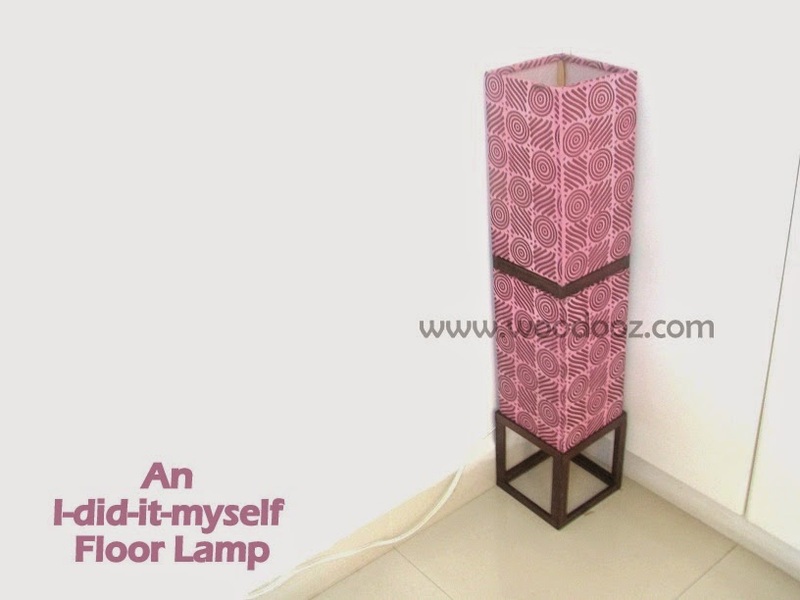 Finally after months and months of delaying, I managed to complete the lamp shade and deliver it. For the base of the lamp shade, I stuck to a very basic design that I have earlier done. The 6mm thick plywood beading was just perfect for what I needed to build. 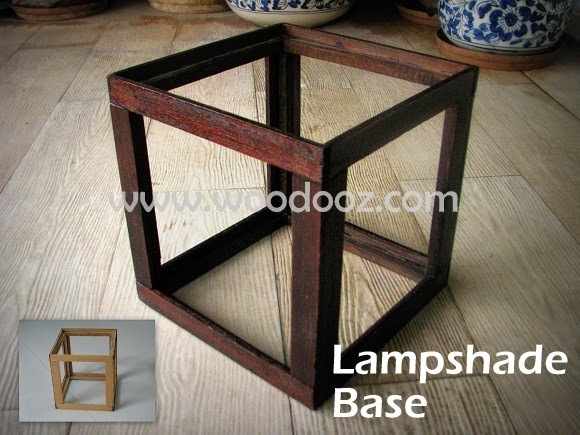 The top of the base has an inset on which the lamp shade frame would comfortably sit. 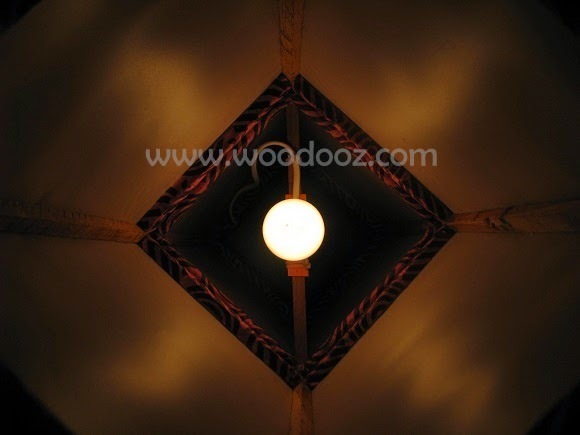 The lamp shade frame was also built using the beading sticks. You can see the skeletal frame in the inset of the below photo. I personally feel these plywood beadings have more purpose and functionalities than just being used as beadings. If only we can wrack our brains and let creativity take over, there is so much more that can be made with these otherwise simple and seemingly useless materials. We instantly fell in love with a nice fabric that we thought would be in right contrast to the dark backdrop. As for the shade design, I broke the monotony by introducing a section in the middle that would split the height of the shade. This was something we were skeptical about right from the beginning, but feel it was worth it in the end. What is your take ? The increasing challenge that am facing of late in making shades is that am not getting ample supply of the required bulb holders. Either because am in a very remote part of the city or because there is no much demand for it. The last time I went to the electrical store, I brought home all of the supplies that he had. Here’s a top view of the lamp shade. 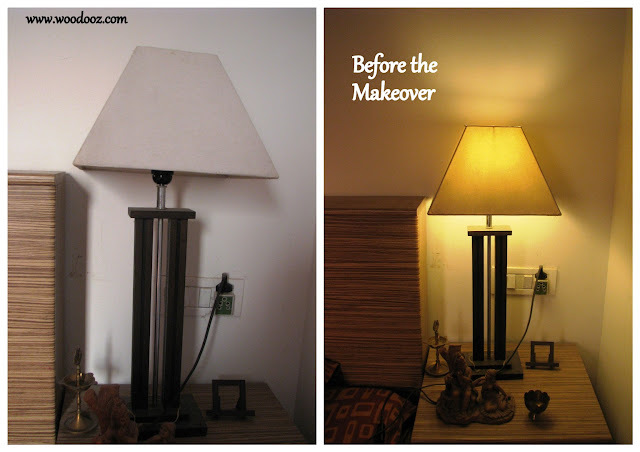 My suggestion : Use CFL lamps as they are warmer and give a very pleasant effect. And finally, the lit effect. We are absolutely loving the outcome. Notice how light is getting distributed in the middle ! Well, it is easy for us to love our work. Do you like it too ? Let me know. If there is anything that needs change, what would be it ? Let me know your thoughts. I hope to continue with more such projects in the future. For some reason, I soooo love making lamp shades. The color, the vibrancy, and the charm around ambient lights is so remarkable that making one has such a fulfilling effect on me. And now your turn : How do you feel about making something from the scratch that someone else is putting to really good use ? DIY Woodworking is a trend that is catching up in India. I have written about my views on Woodworking in India and the myths around it in Woodooz before. Earlier last month, I had the wonderful opportunity to speak to Monty Majeed of The Week – Smart Life on my opinion on DIY. To my surprise, the article was published this month which also featured fellow DIYers Indranil and Sudhakar. Considering the article is in the current month’s edition, I will wait until May (and also seek permission) before I can share the entire article in Woodooz. However, wanted to put the news here and share this proud moment with all of you. 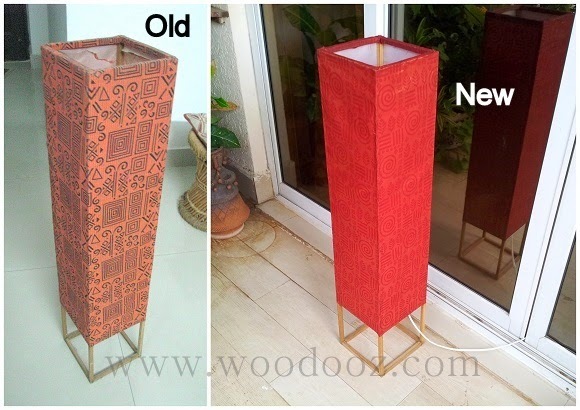 Meanwhile, we had been reworking on an earlier Lampshade that we had built for the home and were very happy with how it turned out. 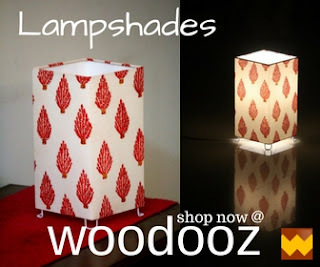 The original lampshade was the one that we built at the very beginning when we started Woodooz. It was our second project and that makes it a very very personal one. Three years have gone and as you can see from the below picture, it needed to be changed. As they say, practice leads to perfection. At least in this case, I am seeing a drastic improvement from how it looked and felt earlier, and how it is now. The frame we built now is stronger and the materials we used are of higher quality leading to a sturdier finish. Right from how it feels to the touch to how it looks to the eyes, the improvised version is 100 times better than the old one. Or should I just say, it looks absolutely professional. Happy for both the news and the improvement that we are seeing with every new project of ours. And don't let the photo fool you. The bleach that you see where the light is placed is a result of my poor photography skill. The shade looks absolutely warm and pleasing to the eyes with the light on. Now, this is is going to adorn our living room for another few years. With all the improvements that have come into this project, I am all excited about the next few projects which incidentally are also lampshades. Hopefully, should be able to complete them quick. Meanwhile, do leave us your comments which probably is the only motivation that keeps us going. 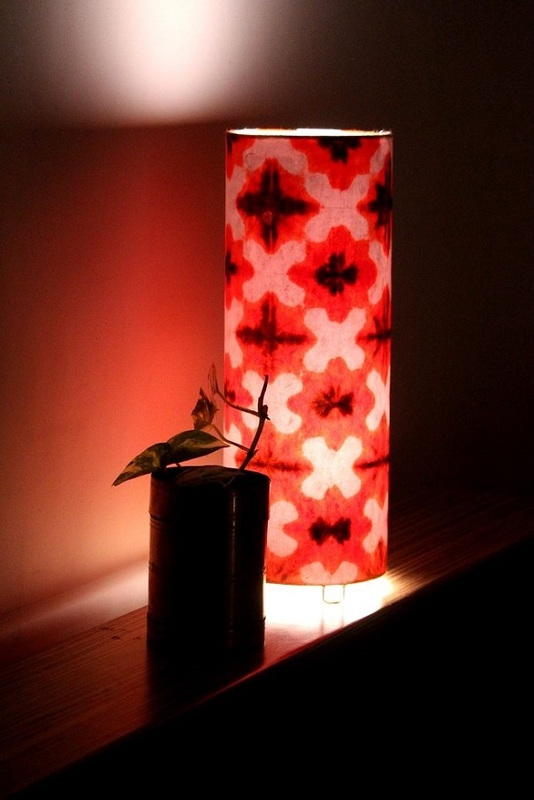 We decided to make a small (31 cm in height and 11 cm width), simple and yet a very colorful shade - something similar to the bedside lampshade that we made earlier. Red and orange with a green patterned border is what we finalized on. We also wanted to keep the base very simple, and used 19mm plywood edge banding sticks to build it. We somehow did not bother to capture the step by step details of this shade because we were racing against time to be fully prepared for the demonstration. To save time, we had pre-built the frame and the base much before the actual demo. We had just enough time to show how the fabric was wrapped around the frame. What you see above (without the the light and after it is lit) is what we eventually came up with. Sooner or later, we certainly shall share the details on how the whole thing was built. For now, just going to leave you with the end product. Blame it on our photography skills, the photo below is not doing justice to how the shade really looks when lit. Nonetheless, do let us know how you like it. We are happy that the shade was picked up by someone instantly after they saw what they saw. Certainly a boost to the efforts that we put into building this one. Leave us a comment. It is the much needed motivation for us in this online world. A plain white lampshade is like an empty canvas. You make what you want to make out of it. 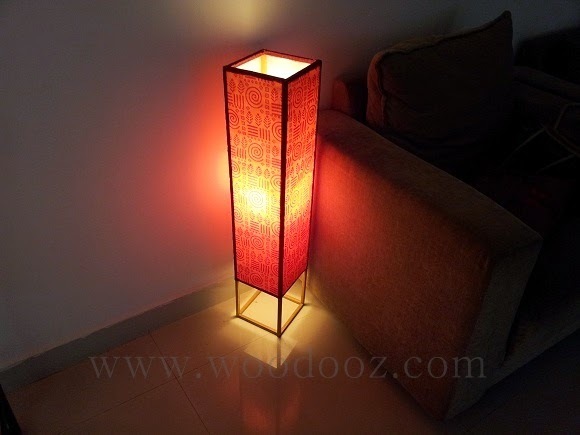 I received this really nice table lamp as a wedding gift and have long been wanting to give it some color. 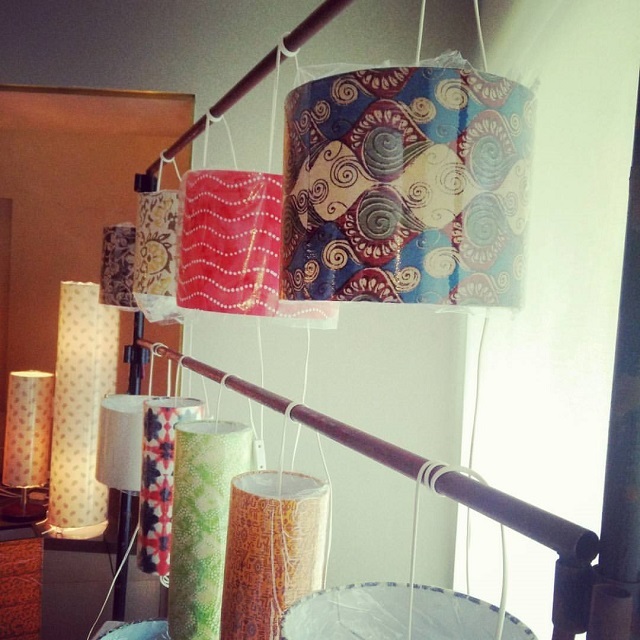 If you have been reading our blog, you would by now know how much we love making our own DIY lampshades. 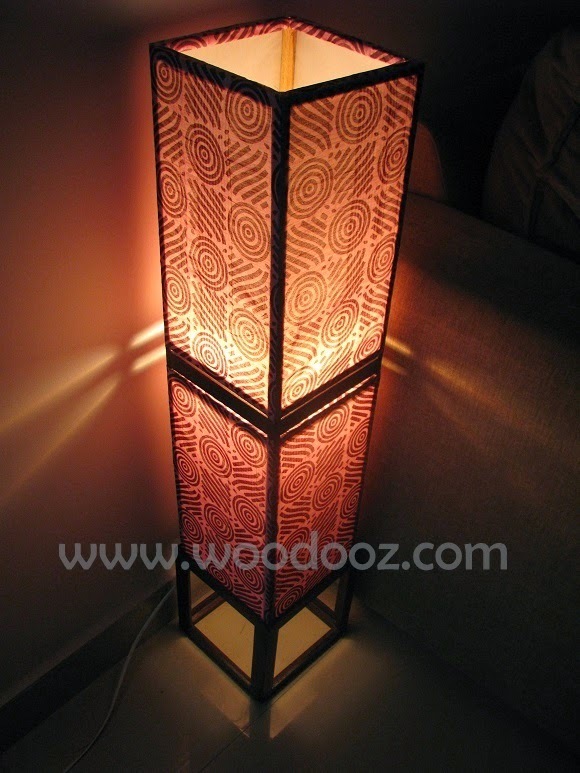 And so, I wanted to do something about a lampshade that didn't have the Woodooz stamp. The shade was made of plain white cotton fabric and that made it much easier for me. 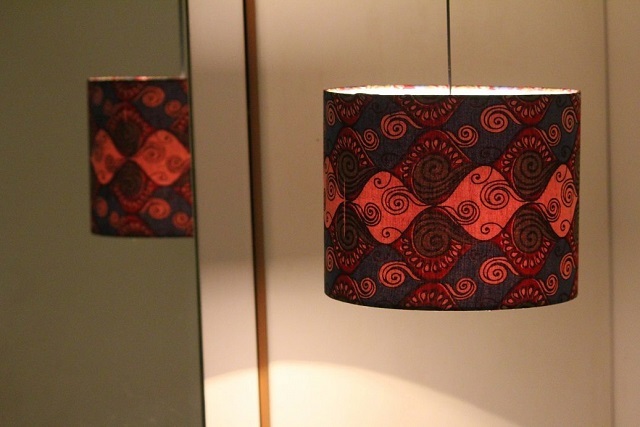 I wanted this to be a really short and easy effort like the 15 minute lampshade DIY and so went with a very simple design. I used acrylic colors to fill the design and so, this is how it ended up looking. I am still undecided about the amount of white space in the shade. For now, I loved the simplicity of it and thought will add more designs and colors later. I used all the primary colors just so it enables me to play around with the bedspread and the curtain colors in the future. Let me know what you think ? Do you think I should have added more elements ? Please leave your comments and make my day. While you do that, I would also request you to join us on our Facebook page. Somu and I promise not to spam your wall. 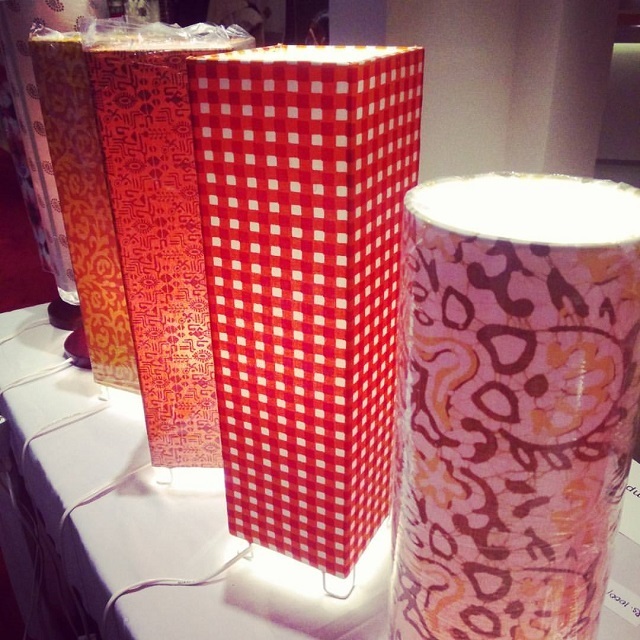 Have you read our other Lampshade posts ? So, we were cleaning up stuff and were wondering what to do with the leftover fabric of the earlier floor lamp . It was just one long strip of cloth and so there wasn't much left to do anything big. We didn't want to throw it off either and so we decided to use whatever that was available to convert our wall lamp into something colorful. So, here's what we did - A quickfire, 15 minute DIY. We unscrewed the glass fitting from the wall, and decided to merely cover it with the fabric. 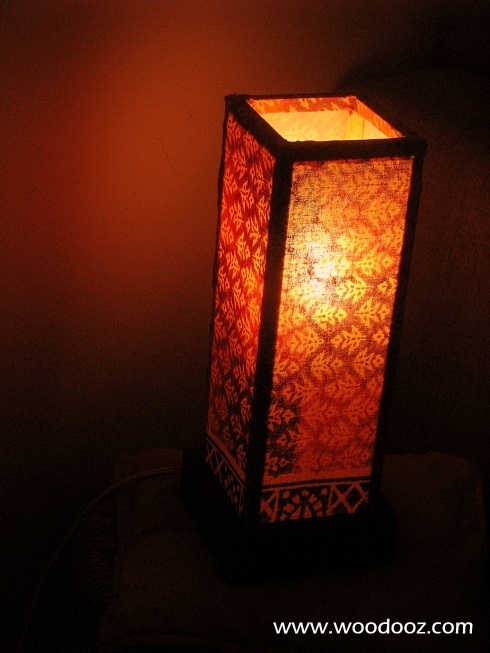 Bed Side Lamp Shade - 2 ! Custom made and sold. We let the user pick the fabric herself and she chose an off white and beige striped jute fabric – Something that is neutral and can be used in any room irrespective of the room’s color theme. 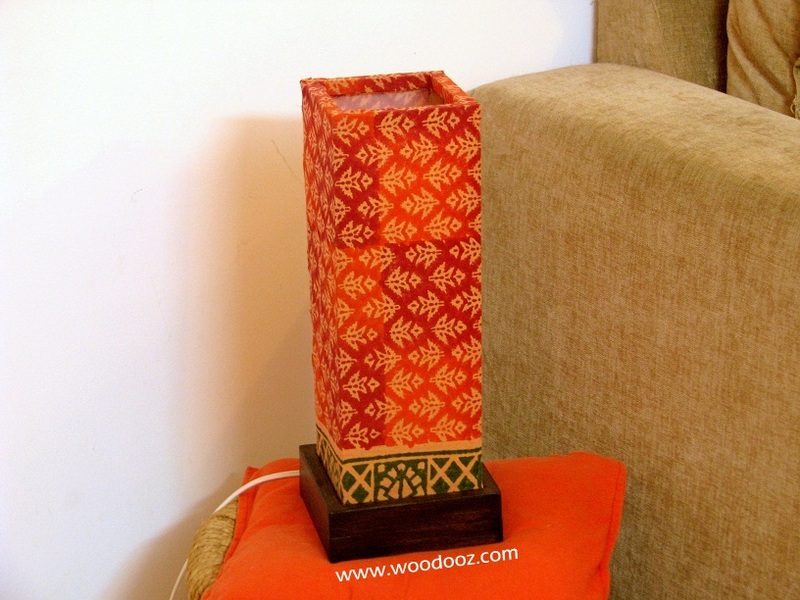 This was built to be used as a corner lamp (placed on the side table) in the drawing room of her new home. The base and the shade were made as separate units. Makes it easily portable and also enables her to mix and match the shade just in case a different colored one is sought in the future. This time around, we also managed to conceal the wire. Loved the way it had come out. Packed and sent !!! Can you imagine that someone actually bought this lampshade ?